I grew up on Rosemary Clooney and “White Christmas.” It was a movie we watched all year long and so my standards have always been pretty high when it comes to the stage adaption. In fact, the last time I saw this touring production I was disappointed. The 2015 production, though, is energetic, lively, and features some of the best tap dancing you’ll see come through town. All the iconic moments and lines from the film are present with the addition of some new zingers and big production numbers. CCM grads Sean Montgomery (“Bob Wallace”) and Kerry Conte (“Betty Haynes”) show their significant training with their rich vocals and excellent acting. Matched with Jeremy Benton (“Phil Davis”) and Kelly Sheehan (“Judy Haynes”), two triple threats in their own right, the four leads in this production shine. Benton and Sheehan’s show stopping tap dancing (along with the rest of the Ensemble, including Wright State graduate Darien Crago) is worth the price of admission alone. Also, it was a treat to see television and film star Conrad John Schuck on stage as Henry Waverly. Cincinnati favorite, first CCM graduate, and Tony nominated Pamela Myers shows why she continues to be in demand. Her performance as former Broadway diva “Martha Megaphone Watson” had the folks seated next to me in stitches. My favorite moments of the show are the big numbers. “Happy Holiday/Let Yourself Go,” “Blue Skies,” and the above mentioned “I Love a Piano” put a smile on my face. While the Tuesday before Thanksgiving might be a little early for some folks to begin their holiday celebrations, I found myself ready for this busy time of year with a renewed vigor and sense of wonderment. 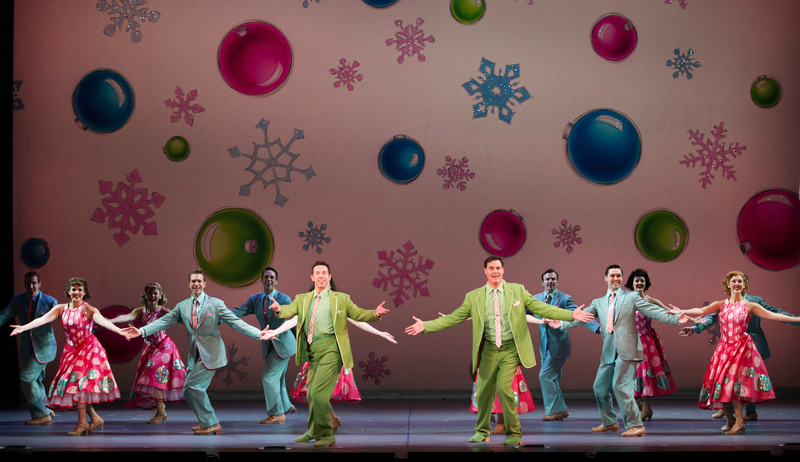 WHITE CHRISTMAS plays at the Aronoff Center for the Arts through December 6th. Tickets and more information can be found here.